There are stones that cannot be captured, e.g. stones that are part of groups with two eyes. No number of moves is enough to capture them, they are alive. There are also stones in atari, with no way of saving them. They can be captured with one move. In between there are stones with multiple liberties which may be involved in races to capture. The easiest liberties to see and count are liberties in the first sense, or dame. 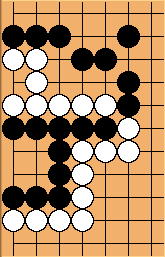 The opponent must make at least as many moves to capture a stone or chain as it has dame. Each marked chain obviously has three liberties. It will take Black 3 moves to capture the White chain. 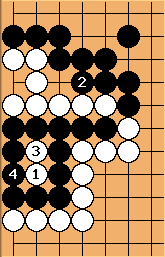 and likewise, it will take White 3 moves to capture the Black chain. The first player wins this race. There also occur chains situated in a more complicated way: there may be moves to play, which are necessary in practical terms to capture them, on points that are not adjacent to them. Also see approach moves, approach liberty and secondary liberties. While both marked chains ( and ) may appear to have only 2 liberties, in the sense of moves to capture them they each really have 3. Black must first connect at the marked point on the edge of the board, while White must take off at a. These plays are required preliminaries, before filling a dame in the race to capture. Filling the dame before making the protective play first is a blunder (auto-atari). Here again, the first player wins the race. The assessment of the necessary moves can get very complicated. For instance, a one-eyed group is often less close to capture than you'd think. Here is an example where a big eye has more liberties than are apparent. Black appears to have only 4 liberties, but actually has 5, the same number as White. This is also a first player win - details in the footnote. The player with the move can capture the other's stones. 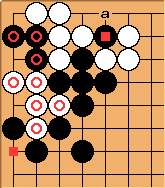 In this seki, or standoff, the opposing chains share two dame, but there are no moves to capture. Whoever approaches puts himself in atari. Sometimes the only way to play atari is a ko capture. Black to play can take the ko at a, threatening to capture White's stones. White to play can make an approach move, say at b, to convert to a regular ko. Such a ko is called an approach ko. Black plainly has 3 moves to capture, but how do we count White's? This sense may be extended to discussion of groups of several chains, to help answer the question 'how many plays does it take to capture that group?' This is actually a considerably more advanced question, which cannot so simply be answered by inspection. See Secondary liberty / Discussion. 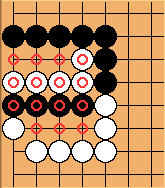 After Black has 3 liberties to White's 2. Black just wins the race. After it is 3 vs. 3.
but White fills it right away.